Many of the things I’d heard about the Texas Hill Country before my visit seemed hard to swallow, particularly the claim that it resembled the south of France ("Provence, Texas"). I was also skeptical about the notion of good wines being produced there. And I had doubts about the music and dining scene in nearby Austin being as vibrant as advertised, although the city had erected a statue to honor its late blues-rock hero Stevie Ray Vaughan. Then there were the rumors of a world-class spa on Lake Austin. Lake Austin? Not to give away too much right at the outset, but everything turned out to be true. What’s more, the Hill Country, famous for its exuberant displays of spring wildflowers, is a splendid fall destination as well. Not only is the weather delightful warm days, cool nights but it’s harvest season, with lots more than just grapes ready for picking (pecans and pumpkins are big here, too). Add to that the flowering of some fine restaurants in Austin and the Hill Country, plus the aforementioned spa, and you’ll understand why, as the song says, sometimes you’ve got to flex your Texas. My wife and I knew we were in for a good time when we walked off the plane and immediately saw that the usual airport franchise food clones had been replaced by locally based outlets like The Salt Lick Bar-B-Q, headquartered in nearby Driftwood. There’s nothing like the aroma of hardwood-smoked beef brisket to take the edge off a long flight and make you eager to get in your rental car and head directly for a nearby restaurant. Austin is, of course, the state capital and home to the sprawling University of Texas campus. The city is a formidable high-tech nexus as well, with Dell computers being manufactured just outside of town. It’s a laid-back place, filled with trees, lakes and rambling neighborhoods of old houses. South of downtown, just across Town Lake, the area along South Congress is lined with clubs and restaurants; the hip Hotel San Jose is here, too. But while this city of 657,000 embraces higher education and expects its politicians to be entertaining a la the late Ann Richards, above all else it reveres and honors its musicians. On any given night, if you so desire, you can hear blues, country, rock and every imaginable permutation at some 150 live-music venues. How cool is Austin? Within two hours of landing, we’d checked in to the Four Seasons hotel downtown, then wandered over to Waterloo Records & Video, the place to pick up some Texas music for the road. It was 5 p.m. on Friday afternoon, and The Gourds, a hot local band with a national reputation, were setting up to play a free concert on the tiny stage right next to the checkout counter. Not only were they terrific, but the store was dispensing free beer from a keg set in the aisles. Free beer and free music right in the store! Does your town have anything like that? I don’t think so. The Hill Country begins about an hour west of Austin on Route 290. It’s a big area, stretching from San Antonio all the way up to Llano, some 80 miles north. And darned if the countryside didn’t evoke the south of France, complete with green hills cut by deep limestone canyons that have been eroded by eons of water coursing through the soft white rock. That stone, quarried locally, was used for the handsome courthouses, banks and other public buildings in towns like Blanco, Comfort and Kerrville. The landscape varies from thoroughbred farms and cow pastures to abundant peach and pecan orchards to rugged, almost wild underbrush. Each spring the region is ablaze with wildflowers bluebonnets, Indian paintbrush, phlox, Maximillian sunflowers and many, many others the pride and joy of former first lady Lady Bird Johnson. Her husband, the 36th president, grew up here in Johnson City on land that had been in the family for generations (the town was named by LBJ’s second cousin, not him). Today their beloved ranch is part of LBJ National Historic Park. We had timed our trip to coincide with the Fredericksburg Food & Wine Fest, held every October in the liveliest and most interesting of the Hill Country towns. 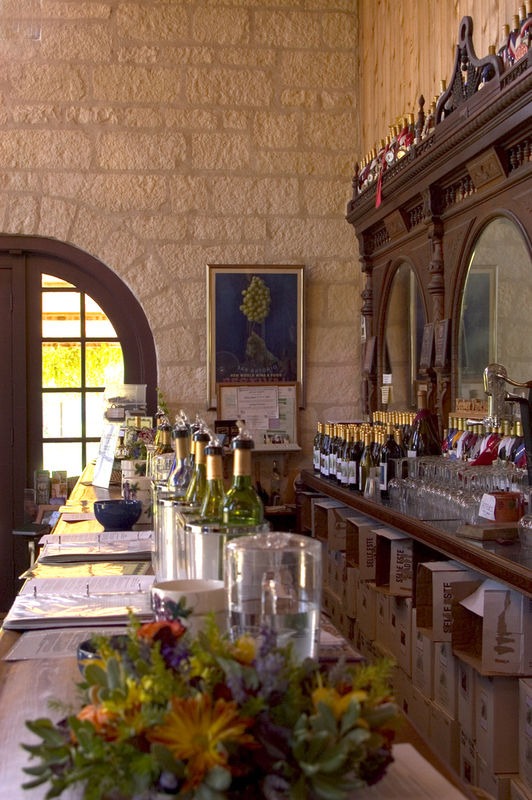 Fredericksburg would be worth a visit even if it wasn’t the epicenter of Texas winegrowing and home to some very nice restaurants and lodgings. It was founded by German settlers in the mid-1800s, all looking for some choice land to homestead. This explains the German-style sausages featured at every barbecue joint in the area. It also accounts for the insistent polka beat and accordion flourishes that merged with the mariachi sounds from across the Mexican border and produced the popular foot-tapping music called Tejano or conjunto. Today the locals are a remarkably friendly mix of conservative ranchers, Austin liberals, San Antonio businesspeople with weekend ranchettes, plus assorted artists. The town itself retains enough authenticity to make the inevitable beer halls and curio shops seem like a thin layer of frosting on a fascinating cake. Main Street is wide enough for a team of eight oxen to turn around in, and there’s hardly a building over two stories. The visitors center, over on East Austin Street, is well worth a stop for some historical, and touristic, orientation. We quickly oriented ourselves toward the legendary Rather Sweet Bakery & Cafe , hidden in a courtyard just off Main. Rebecca Rather’s sensational smoked bacon-cheddar-green onion scones are a perfect portable breakfast or snack, and we found everything else, from the "Big Hair" lemon meringue tarts to fruit-filled pastries, to be, well, rather remarkable. After strolling through downtown Fredericksburg, it was time to get back in the car. Perhaps the greatest pleasure in the Hill Country comes from driving the twisty back roads, with their abrupt changes in topography and scenery. Route 16 from Kerrville to Bandera (Cowboy Capital of the World) is 37 rollicking miles of hairpin curves, sharp green hills and tree-lined rivers. The reward at the end is lunch at the OST the Old Spanish Trail where the $5.95 all-you-can-eat barbecue buffet is rivaled only by the superior enchiladas. For something very different, try Route 32, a.k.a. the Devil’s Backbone, between Blanco and San Marcus. It runs along a high spine of craggy limestone, with dusty turnouts where you can take in the long views. 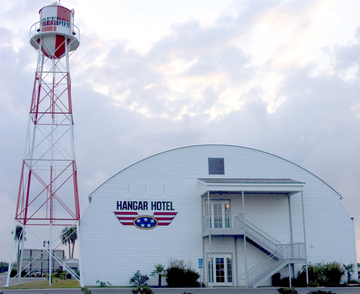 Back in Fredericksburg, we spent the night at the World War II-themed Hangar Hotel, a Quonset hut look-alike whose surprisingly upscale accommodations offered high-quality furnishings and amenities, all right at the airport. The next morning, we drove out to meet Richard Becker, M.D., and his wife, Bunny, at their beautiful Becker Vineyards. Then it was time to sample the output of seemingly every winery in Texas, served up under big white tents in downtown Fredericksburg. The Food & Wine Fest is a celebration of how far the dozens of Texas winemakers have come (in addition to the Beckers’ wines, try those from Alamosa Wine Cellars and Flat Creek Estate). The live music really swings, and the Fest features plenty of Texas food, an auction, cooking demos and high spirits. By early afternoon, we felt we needed a vacation from our vacation, and so after a late lunch we headed back toward Austin for two nights at the Lake Austin Spa Resort. The property sits on a long, narrow arm of water, and the grounds are lush with gardens, flowers and fountains. The Pool Barn is a lap swimmer’s nirvana, while the LakeHouse Spa building is a masterpiece of user-friendly design: private outdoor treatment rooms, comfy furniture, stunning art and antiques. Most surprising was the food: truly exceptional five-course dinners full of both virtue and flavor (the watermelon gazpacho was especially memorable). And in case we felt any smoked-meat deprivation, we knew we’d have one more crack at The Salt Lick Bar-B-Q back at the airport. For information, contact the Fredericksburg Convention & Visitors Bureau; 888/997-3600, fredericksburg-texas.com. OST; Bandera; 830/796-3836; Open for breakfast, lunch and dinner. Dinner for two, about $30. 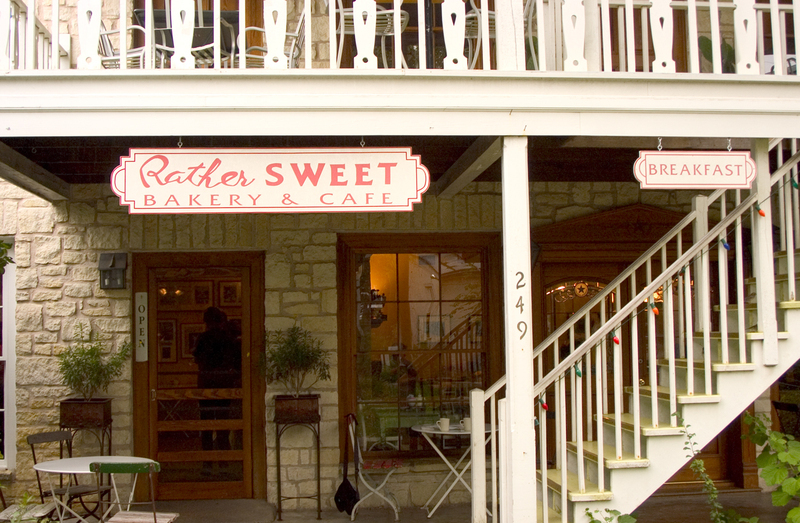 The Rather Sweet Bakery & Cafe ; Fredericksburg; 830/990-0498. 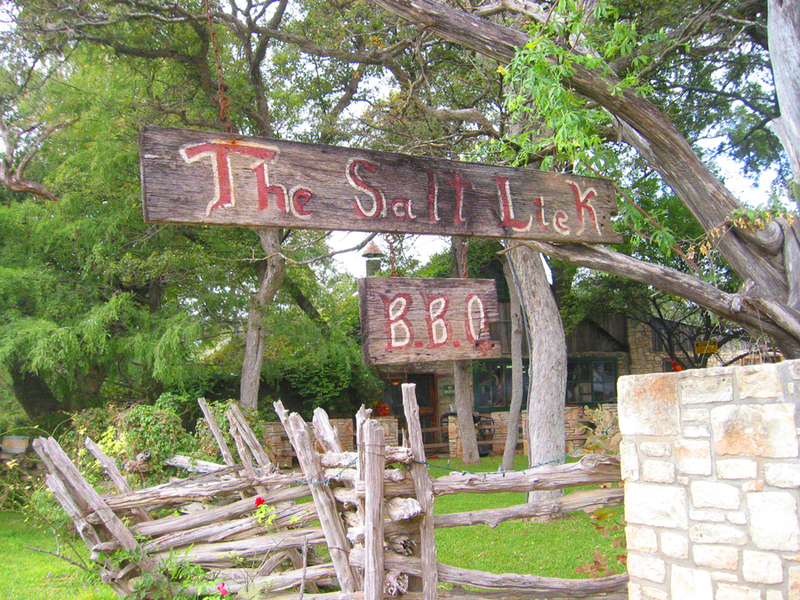 The Salt Lick Bar-B-Q; Driftwood; 512/858-4959; Don ‘t miss the combo plate: pork ribs, sausage and beef for $9.95. Closed Sundays. Dinner for two, about $20. This story first appeared in Diversion.